On 23 June 2018 we will be gathering for an ‘en masse’ cycle tour of areas affected by oil drilling in the South East of England. Sites will include Horse Hill, Brockham and Leith Hill in Surrey and Balcombe in West Sussex. This will be a fun event with riders of all levels and abilities welcome. You can participate for a small section of the route or make a whole day of it. 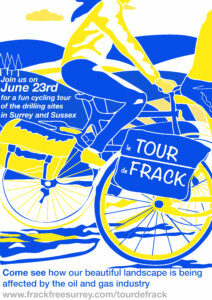 The ride will be bright and colourful, with flags and banners to raise awareness and to get our message out ‘Clean Energy Now’ and ‘No to Drilling in The Weald’. The tour will start from Meadowbank in Dorking at 10.30am. There will be three routes to choose from: 22 miles, 30 miles or 57 miles. Participating cyclists should register at Eventbrite. Leith Hill Community Blues Band has secured a music distribution deal, meaning its recently recorded single will now be available via a wide range of digital outlets including iTunes, Spotify and Amazon. 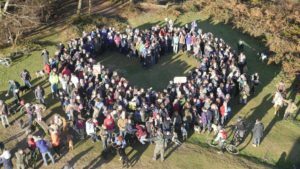 The Dorking-based community band was formed to promote awareness of the oil drilling threat at Leith Hill, and to highlight the role of the Forestry Commission, which leased the drill site to Europa Oil and Gas.